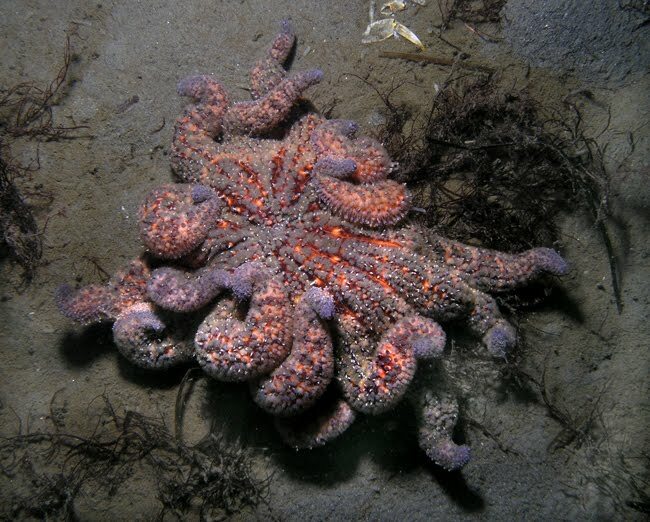 How Dentures, UV Radiation, Covering Behavior and "Collector" Urchins ALL intersect this week!!!! As the woman leaned over the boat...the unthinkable happened, the woman's dentures had fallen out of her mouth and into the Gulf. By the time the woman collected herself... the teeth were gone. Wanting to help, Birchett took the teeth to the Fishermen’s Co-Op and had a sign made saying the teeth were located, hoping they would eventually be returned to their owner. Through the fishing grapevine, the connections were made and the woman was reunited with her teeth. Of COURSE, the article omits the MOST important details! What species?? 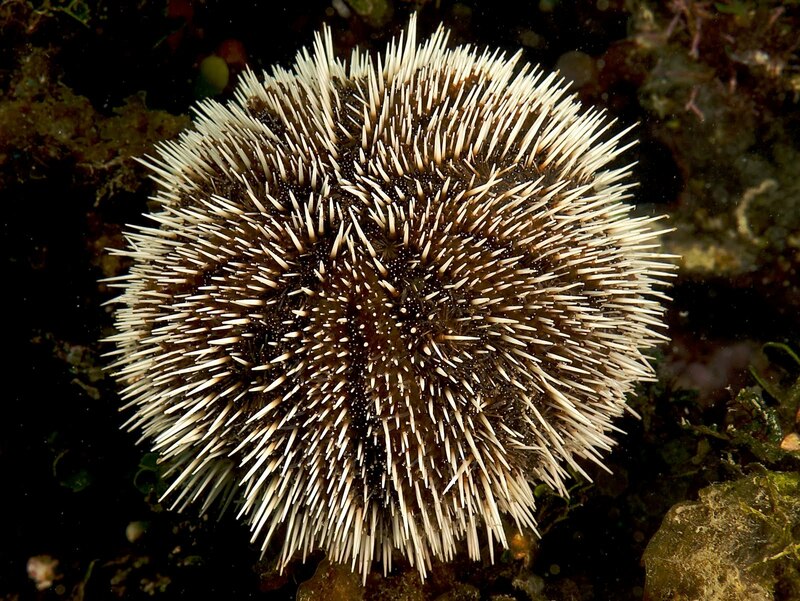 Did you now that this sea urchins' biology may have been directly related to the rediscovery of those dentures?? And what would this have to do with the deadly Ultraviolet radiation in the tropics? 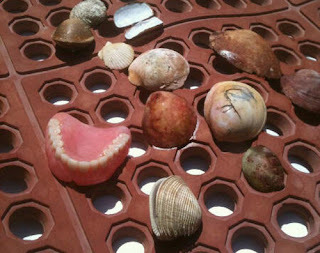 What about the perspective of those dentures from the Sea Urchins' side??? 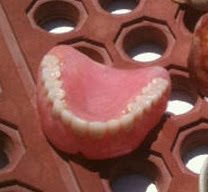 Who could have REALLY used those dentures?? 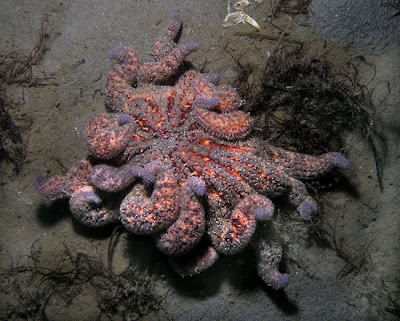 Both are very abundant and commonly encountered species that practice what's known as "covering behavior".. and much of the information in this post comes from two very informative papers by Katherine Amato et al. 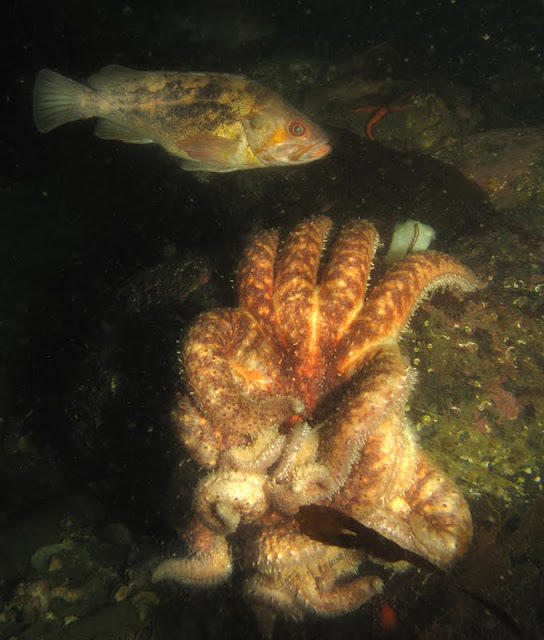 in a 2008 issue of the Bulletin of Marine Science and a paper by Jessica Sigg et al. 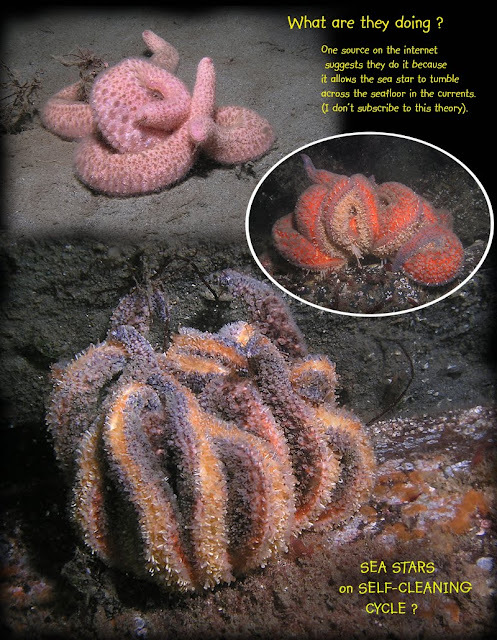 in a 2007 issue of the Journal of the Marine Biological Association of the United Kingdom. What is "Covering Behavior"?? 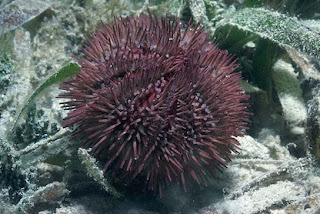 Put simply-Sea Urchins cover their body surface with nearby debris. Presumably, these items are held fast by tube feet on the sea urchins' body surface. Such as this one.. 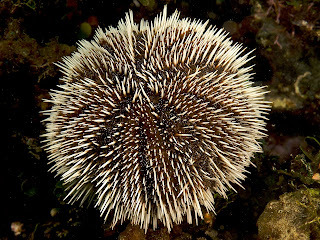 This is practiced by many species of sea urchin from around the world, such as this species from the Galapagos..
and so, the behavior can vary in many different ways, depending on where the animals live. Why Do Urchins Practice "Covering Behavior"?? And What Does This Have to do with Dentures anyway??? So, the urchins cited in the original article, obviously had been carrying that woman's dentures around, as part of its "covering behavior"! 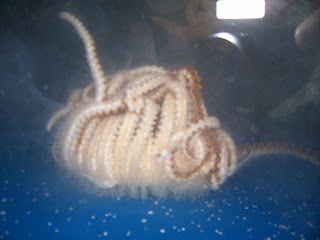 But believe it or not-there may have actually been a GOOD reason for that urchin to be doing so! 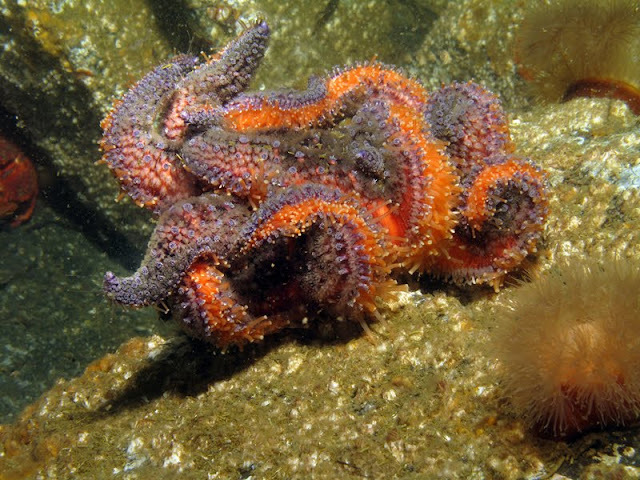 Its tied to WHY these urchins practice covering behavior in the first place. 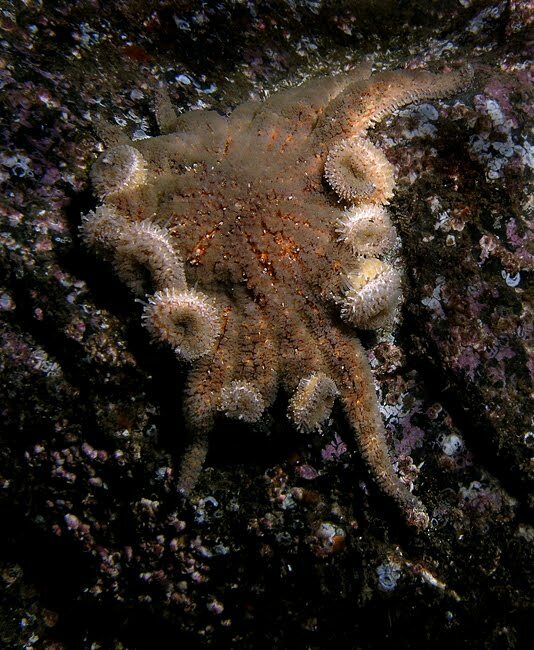 Sigg (2007) and many other authors have presented evidence that the reason, at least some urchins cover themselves with seeming debris is to protect themselves from ultraviolet radiation, which could conceivably damage their gonads or other tissues (as in most animals). 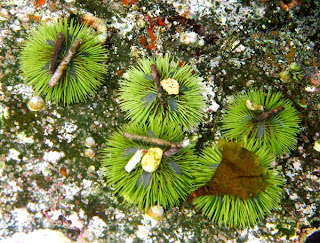 But, some urchins cover themselves with seaweed versus other species which do so with pebbles and shells? Why do these vary? As it turns out, in some cases, it does! Below is Fig. 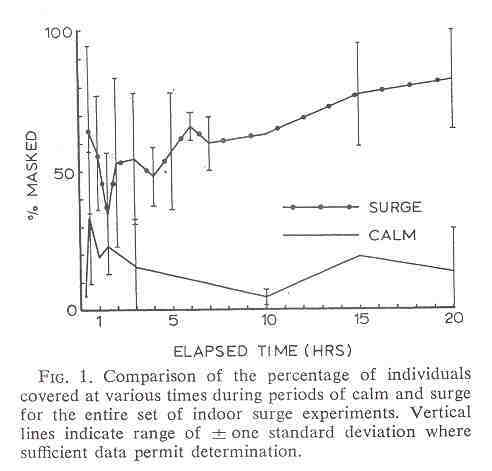 1 from Amato et al. who compares the preferences of two sea urchins (Lytechinus on the left in white versus Tripneustes on the right in black). 1. 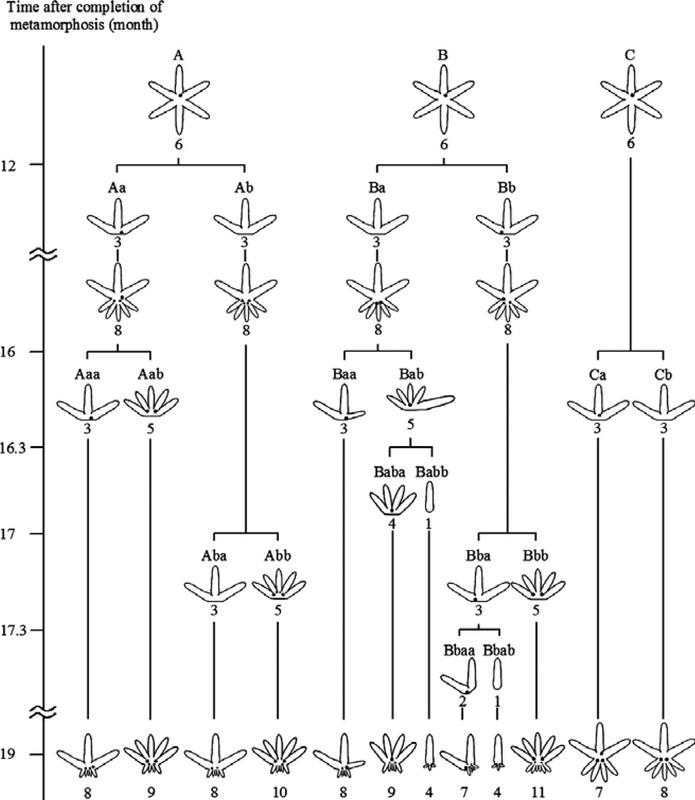 Lytechinus was much more inclined to cover up more of its surface than Tripneustes. 2. Lytechinus likes covering itself up with rubble. Whereas Tripneustes prefered covering itself up with the seagrass Thalassia. 3. But there was some variation depending on the availabiity of materials in the area. So, the way that Lytechinus prefers covering its complete surface with rubble, suggests that it might be MORE vulnerable to sunlight (and as we'll see UV radiation) than Tripneustes. Its choice of rubble further follows that trend in that it seeks out items that will prevent penetration of the sunlight. 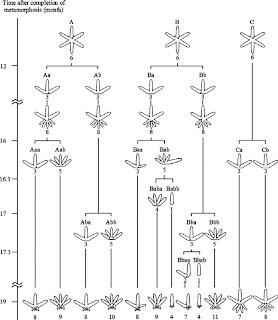 A further study of Lytechinus by Sigg et al. 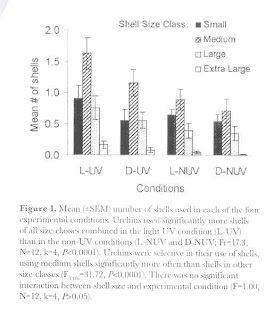 (2008) showed the preferred sizes of rubble and shelly materials that the urchin collected. 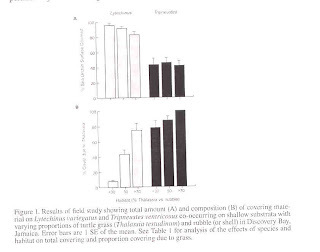 The lab work of Sigg et al., suggested that Lytechinus was indeed suceptible to UV radiation and not simply to light intensity or brightness. Lights alone, apparently did not compel the urchins to cover themselves but UV exposure did, and in fact, UV radiation increased covering behavior! The bar graph above (Figure 1) shows us that of the rubble that these urchins use to cover themselves, Lytechinus showed a clear preference for (the striped bar in Fig. 1) medium sized rubble/shelly debris! 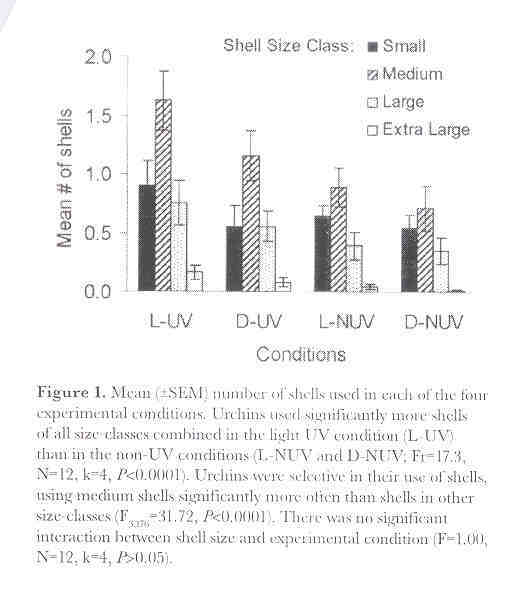 Given that bunches of small sized shells would be easier to hold onto why choose bigger more intermediate sized shells and pieces of rubble? Probably because medium sized bits offer better protection from UV exposure. There's no "cracks" or openings if you have fewer, larger sized pieces!! and the dentures??? Lightweight AND broad enough in size to be capable of broad UV protection/coverage!! Now, you know the REST of the story! A Florida woman's 1200.00 dental costs recouped? or that individual Lytechinus' best defense against the terrible onslaught of UV radiation?? Sexual and Asexual Reproduction in Coscinasterias! Two ways a starfish can get a date on Saturday night! 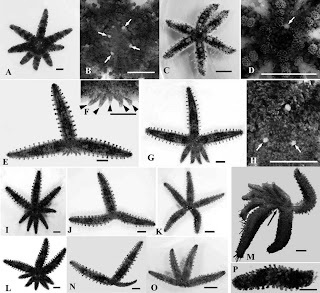 This week..an interesting story about a little starfish from the temperate-tropics that can go from being ONE to FOUR or even SIX starfish all by itself! An ability I'm sure everyone wishes they had when moving furniture or cleaning your apartment! The subject of today's blog, is this guy: Coscinasterias acutispina-a member of the Asteriidae that occurs throughout shallow waters in temperate to tropical waters in the Pacific. 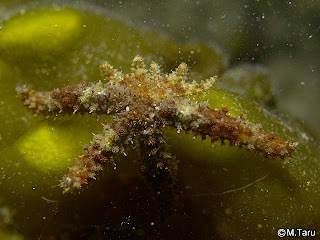 One sees this species throughout Asia and out to Hawaii (see this past Echinoblog). 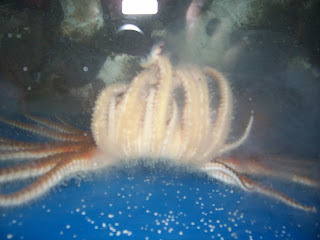 And just to give you a sense of what the animal is like alive, here's a neat video of it turning itself over! But one of the immediate things one notices about this species is how it always seems to have an unusual number of shorter arms. Such as in a specimen like this. Its been observed over the many years since this species was described in 1862 that this species is what's known as fissiparous, or in other words, the animal is asexual-it can divide into two separate individuals! The authors raised C. acutispina from embryos to juveniles and proceeded to observe how these individuals underwent asexual fission. Here, the authors show examples of wild caught adults versus specimens which have undergone fissiparity while in captivity. Ultimately, the authors raised three individuals after 12 months of growing the juveniles and rearing them out. It is quite impressive when you consider this dataset took YEARS to collect! Their results were very intriguing (and were no doubt the result of a long wait!). Over the course of over a year (19 months), these THREE individuals had essentially divided into TWELVE separate individuals! Not evenly...one individual into four, the second into six and the last into two. But that wasn't all! 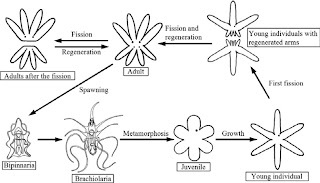 After about 1-3 months, each one of the above (following second fission) had gonads and were able to produce reproductive cells (i.e., gametes-eggs or sperm). 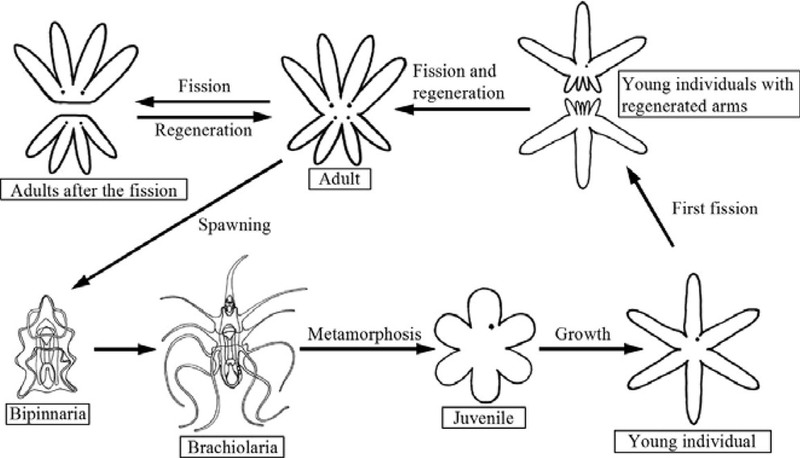 This is almost kind of reminiscent of the life cycle of something like a jellyfish, which also has alternating sexual and asexual life stages. The part missing from the paper though is " What so interesting about it in the "big picture"? 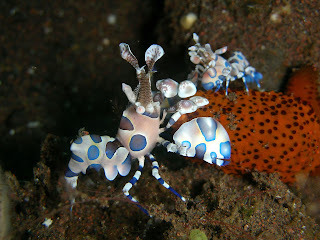 How is this adaptive for this animal's evolution and/or biology? 1. Dispersal. So, this is probably the most logically obvious benefit to being able to reproduce in this fashion. The more individuals are abundant, the greater they are able to carry your genome farther away. Those that survive and are best adapted-carrying on optimal reproductive material- can presumably also divide and reproduce later on. 2. Could asexual vs. sexual reproduction be more energetically expensive? 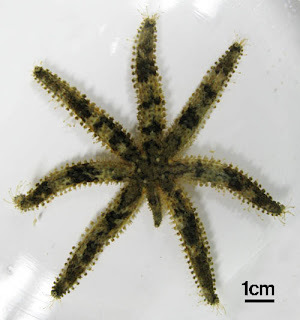 A paper by Crump and Barker (1985) on the New Zealand species, Coscinasterias calamaria observed that those individuals with better quality food were more inclined to divide than those with poorer quality food. Its not clear to me which mode of reproduction involves more physiological energy..but perhaps different species switch off when times are poor? Do the ecologists and fissiparous indivdiuals out there have more to add? Feel free to drop them in the comments!